The highlight of the last two days was crossing the border from Nepal to India. The immigration officer sent the tea wallah for tea while he processed the carnet, then sent him back again for biscuits. Since the border I have probably only met 2 people who could speak English! I couldn’t find the hotel in Gorakhpur because everything is written in Hindi and no-one understood me. Ended up in a pretty shabby establishment. Yesterday up early to be on the road at 5am, but in the poor light didn’t notice there were 2 towns called Basti and, of course, chose the wrong one – so a round trip of 60kms for nothing, except for some great photo opportunities (which I’ll put up in a few days). I ended up at a truck stop for the night as the light disappeared – 50 rupees (less than $1) for lovely homecooked dhal, raw turnips, tomatoes and rotis cooked in a clay oven. I spent the night in a makeshift raised platform -kept me off the ground and dry which is the main thing. Even though no-one understands a word I say everyone is very friendly and helpful. I didn’t eat at all today (Monday) as no food for sale anywhere. Thanks Lynne for packing a few muesli bars for emergencies! I managed to find a better than average hotel for tonight, so a hot shower, a shave and a good meal. My clothes are black from road grime and no opportunity to wash them and get them dry by morning unfortunately. I start each day draining water out of the carburettor – the petrol is obviously watered down – and I have to stretch the inlet valve springs before setting off in the morning. The low points are all the stoppages. Today it was a one and a half hour traffic jam for a special god and I saw a young boy who’d been run over, not by me thank goodness! I should reach Agra in two days if all goes well and will meet Lynne. 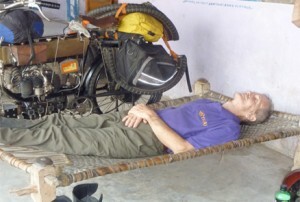 It will be nice to have a few days relaxing and getting my gear clean before we do a tour of Rajasthan together. It is great to see so many followers. Will catch up with everyone’s posts once I’m settled. Thanks for your support & encouragement guys! Apa Kabar to you too Irijanto my friend! Hope we get to meet again one day too and that your FN restoration is going well. It would be great to see it on the road. Keep following the blog and all the best to you and Ronny. Great to see you here in ur hotel with your wonderful Bike . I m a Biker and crazy about bikes , It was a pleasure to see your Amazing Vintage Bike .. I wish you best of luck for your future tours ..
Hi Kunal, Thanks for your posting. Loving your hotel – it beats sleeping in dhabas every day, especially the fact I can have a soak in the bath! Still, the dhabas are clean, have great food and the people, like those all over India treat me so kindly. it’s an amazing country and I’ll take wonderful memories away with me. Will recommend the Golden Tulip, Amritsar to all I meet. Thank you. “Oii, Bloke, oii, ow she run?” Anyway I would love to see some close ups of your motor and bike as she gets dirty. Fantastic voyage. Best of luck to you and thanks. I may do Thailand some day. Thanks, Paul antique Excelsior motorcycles. Just to explain the mechanics of the FN – the engine oil is fed by a dripper at the rate of 40 drops per minute as there are no seals as we know them. The oil then runs out the end of all moving parts. The crankshaft has return grooves cut in it to turn the oil back into the engine but this is only very basic. There is also an additional hand operated pump that lets you pump extra oil when you approach hills. Sometimes the oil is set higher rather than lower so as not to run out of oil, increasing the amount of oil that is discharged to the atmosphere. As you can see, it’s all very basic. The Excelsiors sound great. What models do you have? This is all exciting stuff – you really get the feeling across. Hopefully by now you are with Lynne and enjoying a clean set of clothes and a laugh! We send every best wish for your journey to be safe but exhilarating, punctuated by interesting people and not done entirely on a diet of muesli bars! Had a few days in Agra with Lynne then another few days in Jaipur. Off again tomorrow on my own and we’ll meet up later in the week in Jodhpur. Makes all the difference having someone to laugh with and sort me out – I’m a bit slack when it comes to taking care of myself. Will enjoy the next week together here and there before I leave for Pakistan. Great to hear from you. Lynne forgot the muesli bars in all the excitement so I’m snacking on Indian coconut biscuits!!! Had a few days resting and getting the bike back in shape – ready to hit the road again tomorrow and we’ll meet up in Jodhpur in a few days. Keep at it young Ronnie, we are with you all the way. Really enjoying hearing about the adventure, you truly are an inspiration to us all. Hi Ron, just caught up with Lynne on facebook, enjoy your time together and get those dirty cloths washed!! Way to go, Ronnie !!! It’s fascinating to see your adventures on my computer screen just a few hours after they have actually happened. A friend of mine, Nirmallya who is a bike nut, wants to meet you in Delhi and he does speak English. I think he has written to you already – and may have riden some of the roads of your route north…hope you can meet up with him. Question – why do you have to stretch your inlet valves (and are you taking about the bike or some personal plumbing issue)? Did I answer your question about the inlet valves? They weaken with heat and distance so need to be stretched. Once they’re weakened the top end performance falls off but the starting is easier. My personal plumbing is taking a beating on this hard old seat that’s for sure. I’ve got bruises to prove it!! Never heard from your friend in Delhi unfortunately. You’d love the traffic here Ross, makes Bali look like a walk in the park.